New Speed and Strength Textile Jackets: Stars for Everyone! You like fireworks and other things that go BOOM, but red white and blue isn’t really your speed (your speed is fast, in case you’ve forgotten). The Fourth of July is cool, in theory, but running around like a firecracker popsicle would totally cramp your style. I get it - and so does Speed and Strength. From the people who typically emblazon their gear with all sorts of loudness comes the S&S Stars and Stripes collection which is a bit more stealth. The Speed and Strength Stars and Stripes Jacket leads the charge. An AR-700 water-resistant shell won’t keep your skin intact on the track, but it sure is better than that tattered hoody you usually wear. And if you’re oh-so-attached to that old college sweatshirt, the Stars and Stripes comes with a detachable hood - to remind you of the good ol’ days. There’s a bit more ventilation than your security-hoody as well, and I bet that didn’t come with CE rated armor in the shoulders, elbows, and spine, either. Add some reflectivity, loops for pant attachment, microfiber lined cuffs and collar, and an insulated thermal vest - and you’ve got an old favorite on steroids. Many brands will inappropriately splash obnoxious pinks and purples on a jacket and call it “women’s.” I think that’s ridiculous - and apparently so does S&S . 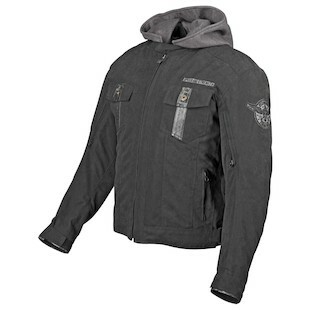 . . at least with this Speed and Strength Star Struck Jacket. With a muted style more akin to a your favorite fleece than princess attire, you’ll be breaking all kinds of Disney stereotypes with this one. It’s no thoroughbred racehorse, mind you, but more like the pony you may (or may not) have wanted as a kid. The majority of the shell is soft, which is to say not very abrasion resistant (but it is water resistant). However, all of the high-wear areas, like the shoulders and elbows, come in a beefy AR-1000 fabric, which will fair much better than the rest. 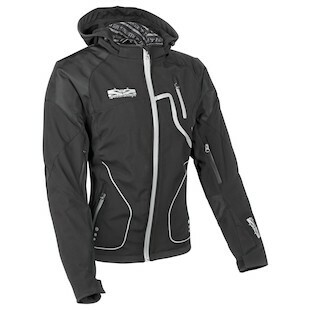 A mainstay of the S & S brand, the detachable hood, is present, along with a proprietary “Speed Zip” ventilation system. For those who like comfort, there’s microfiber along the cuff and a cinch cord around the waist. For those who like safety, there’s a belt loop attachment for pants and a decent amount of reflectivity throughout the jacket. Go 'Boom' this season, and pick up your stars from Speed & Strength!